1. Ingestion - Taking in food into the buccal cavity through mouth. 2. Deglutition - The passage of food bolus from oral cavity to stomach. This is also called swallowing. 3. Digestion- Since the organic constituents of the food are large and cannot diffuse through the gut wall to enter the blood stream. Hence these constituents have to be broken down to simpler forms. Mechanical -this includes physical breaking of solid pieces, churning of food and movement of food along the digestive tract. Chemical- this includes hydrolysis of food macromolecules with the aid of enzymes present in the digestive juices. 4. Absorption- The process by which the digested nutrient molecules are taken into the cells of a living organism. 5. Assimilation- The process by which the absorbed nutrients are incorporated into the cells/tissues..
6. Egestion- The elimination of the undigested food. The process is called defaecation. 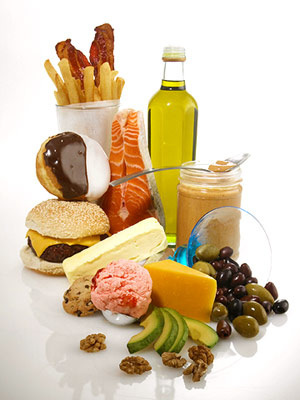 The food we eat contains carbohydrates, fats and proteins which are broken down to simpler molecules for absorption. Carbohydrates in the food are in the form polysaccharides (starch, glycogen and cellulose) oligosaccharides (dextrin) and disaccharides (sucrose and lactose). These carbohydrates are broken down by carbohydrases to monosaccharides that can be absorbed easily. The carbohydrate digestion begins in the buccal cavity and is completed in the small intestine. Food remains in the buccal cavity for a very short time, hence only 30% of digestion takes place here. Mastication breaks the food into small pieces hence, facilitates the action of salivary amylase. The gastric juice in the stomach does not contain any carbohydrate digesting enzymes. The HCl present here also destroys ptylain. Hence there is no carbohydrate digestion in the stomach. Pancreatic amylase hydrolysis starch to maltose, isomaltose and dextrins. Intestinal amylase, maltase, sucrase, lactase, isomaltase, limit dextrase. Intestinal amylase breaks down any remaining carbohydrates to disaccharides. Limit dextrase- limit dextrins to glucose. Digestion of lactose- milk sugar is not digested properly in adults due to lack of lactose(the amount decreases with age). The undigested lactose gets fermented and this results in flatulence, intestinal cramps and diarrhoae. Digestion of cellulose- due to lack of cellulase in humans cellulose is not digested. This forms the roughage. Buccal cavity- Saliva does not contain enzymes for protein digestion. Thus proteins are not digested here. Gastric juice contains two proteolytic enzymes in inactive form. Pepsinogen and Prorennin. Pepsinogen- is activated by HCl and the active form pepsin acts on proteins. Acidic pH is maintained by HCl. Disinfects food by killing bacteria. Stops the action of salivary enzymes. Pepsin also helps in coagulation of milk. It hydrolyses casein to paracasein and whey proteins. Paracasein is precipitated as calcium paracaseinate to form solid curd. Pepsin can also hydrolyse collagen and other proteins. However, keratin of hair, skin and nails or horns cannot be hydrolysed by pepsin. Rennin also helps in coagulation of milk. Rennin is secreted in the form of prorennin that is converted to active rennin in the presence of HCl. Most proteins are digested in the duodenum of small intestine. Duodenum receives secretions from pancreas and liver. Bile does not contain any enzymes hence it does not help in protein digestion. Pancreatic juice- contains trypsinogen, chymotrypsinogen and procarboxypeptidase. Trypsinogen is activated to trypsin by enterokinase. Trypsin further activates chymotrypsinogen to chymotrypsin and procarboxypeptidase to carboxypeptidase. Trypsin converts basic proteins to peptones and peptides. trypsin hydrolyses fibrinogen to fibrin and coagulates milk. Chymotrypsin converts proteins to peptides. This also help in coagulation of milk. Carboxypeptidase hydrolyse the terminal peptide bonds in a peptide chain acting on the carboxyl group. Aminopeptidase hydrolyses the terminal peptide bond acting on amino group. Dipeptidase hydrolyse dipeptides to amino acids. Tripeptidase hydrolyse tripeptides to amino acids. Buccal cavity- no enzymes for fat digestion. Stomach- Some amount of fats are broken down by gastric lipase into fatty acids and glycerol. Intestine- duodenum receives bile and pancreatic juice. Bile salts emulsify fats i.e, large fat globules are broken down into fine droplets called micelles. Innumerable number provide larger surface area for enzyme action. Pancreatic lipase and intestinal lipase hydrolyses fats into diglycerides and monoglycerides. Absorption - the products of fat digestion from micelles enter the luminal epithelial cells by simple diffusion. There resynthesis of triglycerides takes place. The triglycerides combine with proteins to form chylomicrons. These chylomicrons via exocytosis move into the lacteals and then into the blood stream. Absorption is the intake of digested food nutrients by the cells. In the buccal cavity and oesophagus- no appreciable amount is absorbed. In the stomach- water, alcohol and some amount of glucose. Passive absorption- diffusion, osmosis and facilitated diffusion. Active absorption- Energy is spent while obtaining certain substances. Nucleic acids are digested in the small intestine by nucleases, nucleotides and nucleosidases. The end products are pentose sugar, purines and pyrimidines and inorganic phosphates. Assimilation is the incorporation of the absorbed food materials in the cells/tissues. Carbohydrates –simple sugars are absorbed and used to produce energy. Extra sugar is converted to glycogen and stored. Proteins absorbed and used for synthesizing various types of proteins. Fats are absorbed and stored in adipose tissues.